What is more appealing— replacing your commercial roof every 10-15 years or having your existing roof stay intact for more than 25 years? 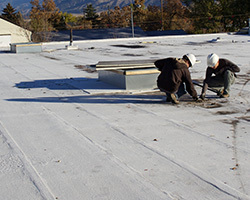 With a good commercial roof maintenance program in place, you don’t have to settle for ongoing, costly roof problems or premature roof replacement. Routine inspection and maintenance performed by a capable professional will help keep those heavy expense burdens at bay, ensure your roof warranty is valid, and increase your roof’s odds of lasting for its life expectancy. At some point, all roofing systems have problems. 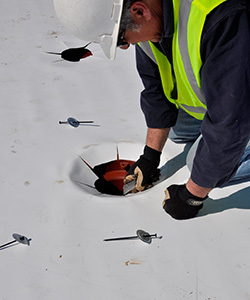 Leaks, cracks, blisters, surface erosion, weathering– those are just a few of the many problems a roof may encounter. Even the smallest leak can have a huge impact. If it’s left untended, it could lead to a host of major problems and some expensive roof work. Doesn’t it make sense to stave off those problems, save money, and delay the need for roof replacement for years? Well, that’s what roof maintenance does. It identifies roof damage in its early stages, and it documents the early signs of possible big roofing problems before they pop up. To put it into laymen’s terms, it’s a mix of light roof doctoring and preventative diagnostics. For the building owner, the advantages and benefits couldn’t be any clearer. To put it in simple terms, a good roof maintenance program can translate into thousands of dollars in savings. There’s another thing that’s just as important as the need for roof maintenance. The people who handle the maintenance program need to be capable roofing professionals with strong expertise and solid training credentials. After all, letting the wrong person on a roof can invite in disaster or, worse, a complete roof failure. Choice Roof Contractors take your roofing needs very seriously. They have all undergone a well-respected, comprehensive commercial roof systems training seminar for additional expertise. They also abide by the strictest professional standards for roof servicing and all-around performance. Even better, those factors are one extension of their commitment to providing completely professional roof maintenance services. For the lifetime of their business, Choice Roof Contractors also have access to highly-experienced roofing contractors who are available to answer questions or concerns. In other words, building owners can be assured by our contractors’ access to around-the-clock access to highly professional roofing experts and an extensive roofing knowledge base. When is Choice Roof Contractor Group’s Maintenance Program Available? One of our quality-minded professionals will be available to inspect and perform light maintenance on your roof on an annual, if not semi-annual basis. 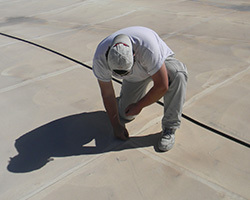 Roof inspection and maintenance sessions are best done in the spring and fall. Many building owners schedule their springtime session sometime between April 1-June 30 and/or the fall session sometime between October 1 and December 30. For wintertime sessions, it is recommended an inspection and maintenance service be done right before the next rainy season. Another thing to keep in mind is location. Some areas of the country have high ultraviolet ray exposure, coastal climates, or places subject to high-speed winds. In those areas, semi-annual sessions are a recipe for best roof damage control and containment results. When a Choice Roof Contractor services as your roof maintenance service provider, your roof is backed by a lifetime service guarantee for roof support and maintaining. How? As noted earlier, all Choice Roof Contractors go through Conklin’s hand-on training program, where they get expert training in the ins-and-outs of Conklin roof systems. Because they become experts of the Conklin roof product line, when one Choice Roof Contractor is unable to take care of your roof, another can step in and provide the same level of unbeatable service. You’ll never have to settle for anything but the best service for the duration of your roof’s life, ever again! When a roof is inspected and maintenanced, the details of what was done are recorded in the roof’s history documentation. A detailed roof history is invaluable in situations such as insurance claim filings, where critical details can be cross-checked and referenced when necessary. 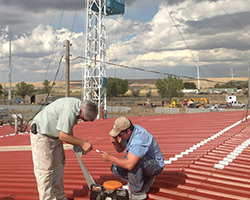 A roof maintenance schedule can also add value to your building. By proactively taking care of any problems, you can add many years of life to your investment. Roofs are built to last for years, but they will have problems at some point. 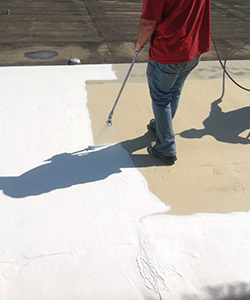 Whether it’s premature wear, deterioration from prolonged sun exposure, ponding water from a leaking HVAC unit, or something else, the roof will have a difficulty that will require immediate addressing. Some problems may even be undetectable to the untrained eye. When you want to put your roofing concerns to rest, you can count on Choice Roof Contractor Group to give you the answers you seek! Feel free to contact us for arranging a roof maintenance program that’s fitted to your unique scheduling demands. We look to earning your trust from the first moment you contact us!